If you have not heard or read Sun Stand Still by Pastor Steven Furtick you need to get it an read it now! As I write this I have not finished reading it but it will change the way you pray and the way that you approach dreams that God lays on you. What will happen when His people will dare to ask God for the impossible? The basis of sun stand still prayers is all about Jesus and the glory of Jesus Christ. As we enter into a new way of praying the power of God almighty is unleashed into the world in and through us. In the upcoming days I will share with you all what my sun stand still prayer is and the dreams that God has placed on my heart. I was recently given a bunch of home-grown zucchini and ended up shredding it for use now and for freezing. I immediatly thought of this chocolate cake that my grandma Lacher use to make when I was small and visiting her house. I loved to help her make it and totally enjoyed sharing in the eating of it, she seemed to always have it around in the summer. Preheat the oven to 325 F. Cream together the butter and the sugar. In a small glass mix together milk and vinegar or use sour milk. Add in oil, eggs, vanilla, and milk mixture and mix. In a separate bowl combine cocoa, baking soda, cinnamon, salt and flour. Sift or mix the dry ingredients together so they are combined well. Slowly mix the dry ingredients into the creamed mixture until well incorporated. Fold in the grated zucchini. Pour mixture into a greased 9 x 13” pan and spread evenly. 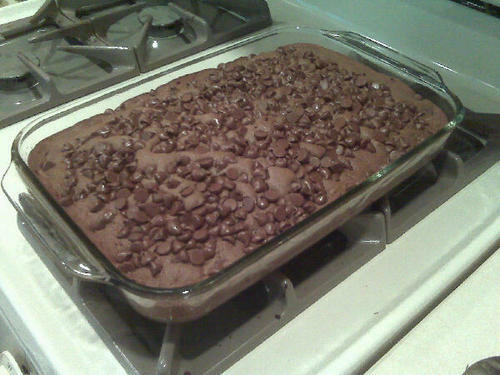 Sprinkle the chocolate chips evenly across the top. Bake for 40 to 45 minutes. After my first time making this today with my two little girls we sat down for a piece of cake while it was still warm. The flavors and memories of my childhood sharing this cake with my Grandma Lacher came flooding back in. Enjoy folks and make a memory with your children today. Side note: The original recipe called for ½ cup of sour milk, since we don’t tend to have sour milk readily available the use of the 1 Tbsp of white vinegar to milk will to the trick. As an avid backpacker and coffee connoisseur I continue to find a better method for preparing coffee on the trail. My current preferred method is with my GSI lexan french press, this provides me with the best tasting cups that I have had on the trail to date. The only issue that I have is that I purchased a larger press that is a bit bulky for when I am going solo or when I am the only one on the hike drinking coffee… I digress. For some time now I have seen and heard about Java Juice Extract as an option for coffee on the trial. With a recent purchase on Amazon I picked up a ten pack to give it a try. This morning with my man Sean Bartley from journeys coffee we gave it a tasting. First impression of the packaging, it would dramatically reduce pack weight and bulk. Upon tearing open the pouch I found the pre-defined opening to be nice and small, great for helping to reduce possible spillage. I grab a set of scissors to open it up more to be able to smell the extract before adding it to the waiting water. Well that was a mistake, the smell of the extract was that of worcestershire sauce or if you have ever had Samuel Adam’s Triple Bock, either way the potent aroma that hits your nose almost made me not want to pour it into the water… so if you are going to give this a taste test, I suggest you skip the sniffy sniff of the extract itself. Move on then to adding the extract to 11 oz of water at 190 degrees. After a little stir to ensure consistency in the mix I have it a sniff. Okay, the extract smell is still there in the final cup all be it a little mellowed down and I was able to also pull out some slight nutty aromas and sadly that was about it. Moving on to the taste testing with a quick sip, I found there to be almost zero flavor with a slight hint of “brown water”, really to me this had an extreme lack of flavor and no finish. I have to say I was pleased that there was no finish, I don’t know if I could have handled having it on my palette. I gave it a few more sips to see if I was missing something then dumped it, sorry Java Juice this is a major pass for me. I shall continue to search out some other options. I believe my next trial will be to see how the AeroPress can preform on the trail. If you recall from an earlier post, I have had some issues with Verizon. Today I received a response from them on my support call again after they pushed out the NFL app to everyones Blackberry service book. Thank you for contacting Verizon Wireless. As a reflection of my commitment to provide the best customer service possible, Unfortunately there isn’t a way to turn off automatic update on your blackberry. The phone is designed to receive automatic updates the only way not to receive automatic updates is to turn data off completely. By doing that you will not be able to utilize the full experience of the phone.If this continues to be an issue for you we do have other devices that doesnt not allow automatic updates. We appreciate your business and thank you for using Verizon Wireless products and services. Well what are your thoughts on that? I say fine if they are not going to turn off automatic updates to my phone then stop putting apps on my phone. Again, I state that I understand that these are not the full app but app install links. I would really be interested to hear what some technical folks have to say, is this not possible from the servers that VZW is running for their customers? As you read this, you will hopefully see clearly that there have been a few times now that I believe God has clearly spoken to me. How you ask, well let me tell you by way of the accounts. The first time that I clearly recall hearing God, freaked me out. This to date is the only time that I believe I audibly heard Him. I was showering and praying about what the heck the day would bring when, as clear as can be, I heard a voice tell me that I was going to pray at the firehouse and over the fire fighters. I seriously looked around to see who was in the bathroom. I was a bit freaked at first, and spent most of the day then wrestling with God on if He really wanted me to do this. Really, I spent most of a day bantering back and forth over something so small. I finally said You got it, picked up the phone book, found the number for one of the stations in town and called. I headed over around dinner time and had a chance to sit around and find out a few of their stories. Before leaving I had took the opportunity to pray over the firehouse and the men that were their. It was humbling to hear the voice of God asking me to do something so simple yet so powerful. Like I said above, that is to date the only time that I have heard the voice of God audibly speak to me. The other two encounters I am going to share came differently. Messiah believed that we were being called, and still do believe, to take journeys out of our current building and to bring it to Main Street to create a coffeehouse ministry venue. Early in the process of imagining what this could be, I had been seriously praying over where God wanted us to place the coffeehouse. We had found a location right on Main Street in Midland and really felt like it was the place. Several of us had prayed over the location, but there were other offers starting to come in all at once on a building that had been sitting empty for over a year… So one night after a long day of working numbers for the new venue and endless hours working on other portions of the technology issues around Messiah, finally I made it home. Family time is always a wonderful thing to come home to after a long day, and as on every other normal night, Erin and I did the standard family routines and then Erin and I dropped into bed. I was exhausted off my feet… but I could not fall asleep. After tossing and turning, I found myself praying and asking what was on my heart that I had not confessed or didn’t understand. God and I had a great talk that night and then I drifted off to sleep. A few hours later, I had the most vivid dream I can recall having. As simple as the dream was, I clearly heard God tell me that the He was giving us the building and to not worry. Okay, so first I tell you that I audibly hear the voice of God while I am showering and now I tell you that while I am sleeping one night He comes to me in a dream and tells me that He will give Messiah a building for launching a Main Street coffeehouse ministry venue… if you are still with me, that is right. It was an amazing and powerful dream that woke me up and I knew that it was truly God that had given me the dream and spoken to me. Now to the present where I have been wrestling in pray for months with God over something and not knowing which way to go, what side is up or down, and really at a loss for the direction on how to proceed. While Erin and I were recently on a small vacation I had lots of time to do nothing. Nothing except spend some amazing time in prayer as I continued to wrestle with God over this. After several days of this and being deep in His Word, I was awoken by another amazing dream that laid out the answer. I know above I said the dream about the coffeehouse building was vivid, but this tops it. The details of this dream are captured and will be shared in time, but I am humbled to have been awoken by this dream and to know it was God clearly speaking to my heart on the matter. Simple and humble amazement washed over me for my Creator. So there is it. I don’t know how or why God has chosen to speak to me in these ways but I am blessed to have listened and acted as He has called. When God gives you a vision for something you need to write it down and do something about it. Christians have walked away from God’s command to steward the whole planet, which is why so many people have picked up the call even though they don’t believe that God created it in the first place. Collaboration is important to sparking innovation. But innovation should not be slowed by pride (people wanting credit for the new ideas). There are business strategies that are creating the potential of unleashing opportunity like never before. So we are taking the steps to write it out in legal form so that something can be done about and with it. The glorification of this work shall not be placed on us but to the Lord, it is all about the Kingdom impact through a vision that has been given. This is the first recipe we have tried out of the Beachbody Power 90 Recipe Book. Delicious! Prepare brown rice according to package directions. Saute onion and garlic in 1 Tbsp of stock until tender. Add remaining stock, chickpeas, vegetables, and tomato paste; stir together. Sprinkle in curry powder and mix well. Simmer for 10 minutes or until cauliflower is tender. Serve over rice. Serves 2.